A legal counsel of the Catholic Educational Association of the Philippines said that the Commission on Higher Education has no injunctive power like courts to issue a moratorium which is a temporary prohibition of a certain activity such as educational field trips. Due to the recent bus crash incident in Tanay, Rizal that claimed the lives of 15 individuals, the Commission on Higher Education on Tuesday imposed a moratorium on field trips and educational tours in all higher education institutions across the country. A film making competition where participants are tasked to complete a short film in 24 hours with “race-style challenges and obstacles” will be one of the activities for this year’s Araw ng Dabaw celebration, organizers announced in a press briefing here Monday. The jealousy was serious to the point that he threatened to kill Aiza if he catch her having an affair with another man. Women from various sectors gathered in the Rizal Park, this city on Tuesday afternoon for the annual women rights campaign “One Billion Rising” coinciding the observance of Valentine’s Day celebration. The National Youth Commission is urging parents to be more open towards having their children tested for Human Immunodeficiency Virus or HIV infection. On the eve of Valentine’s Day, members of the Davao City Police Office led by DCPO Chief Sr. Supt. Michael John Dubria serenaded and entertained the residents of the Co Su Gian Home for the Aged in Barangay Cabantian, Buhangin District here to show that Valentine’s Day is not exclusive to couples. 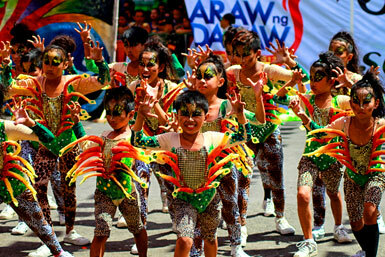 The City Tourism Office is projecting an estimate of 200,000 visitors who will jointhe 80th Araw ng Dabaw celebration in March this year. Muslim and non-Muslim women here gathered to mark the World Hijab Day to demand the right of Muslims to use hijab.